Congrats On Becoming A Member of Nicheology! Read This Page To Get Access To An Additional $2,281 In PLR Value For One Ridiculously Low Price! Get Private Label Rights To My 50 Video "G-Hacks" Course Which Unveils 34 Ways You Can Profit From Google's Tools Including Their Top Secret Tools That No One Else Is Telling You About! Simply Download, Upload, Start Selling! Discover 34 Google tools you can use for more success in your business! You don't have to be a marketing expert to create high quality, in demand Internet marketing related products to sell because I have done that for you! I have created info products for best selling authors, professional athletes, and numerous globally recognized speakers and business experts. This Internet business allowed me to have the time freedom and lifestyle to live where my family and I choose to live and allows for my wife to pursue her dreams of acting. In fact due to her pursuing acting we even had the time and money to help produce a SAG feature film called "Unbelievers". I love this business, and I want to see you succeed in it too! Information products have been huge for my success. They positioned me as an expert early on, and helped me to build up my email list of buyers. My product with PLR can give you that opportunity too! Trying to sell a unique, in demand Internet marketing product isn't nearly as easy as us fellow Internet marketing experts make it seem, is it? • invested in various "how-to" courses. ... and they all left you with frustrating results. These days, I've managed to achieve quite a bit of success... I'm able to have a large library of info products that I don't have to create, I can also sell a ready made product and keep 100% of the profits, and I'm very lucky in that I can quickly put products online for sale. When I first started out, I didn't know how to make my first info product, I couldn't bring myself to just getting it created, and I was afraid I would not create a product that was good enough to sell. None of it worked out for me and I just ended up ready to quit, thinking I would never be able to sell a unique, in demand Internet marketing product. • You've stared blankly for hours at your keyboard trying to create your product which just resulted in wasted time as you constantly end up at square one. • You've invested in various "how-to" courses which led to additional costs with little or no financial return. • You've struggled to even make your outline which just ended up in you moving on from creating info products, and potentially leaving life changing income. I was just about at that point when I stumbled across PLR products for the first time. With this amount of success, I knew I couldn't keep it on lockdown. Since then, I've run into multiple others who encountered the same, never-ending battle I went through. And it seemed pretty unfair to keep it to myself... especially since it's been such a huge stepping stone in my success. So I'd like to let you in on the "secret." You can also use PLR as bonuses for your products, membership sites, coaching programs, affiliate bonuses, or for your next product launch! Sometimes we forget that Google is more than just a search engine or an email provider. They have a large variety of tools that many of us didn't even know existed! You can leverage these tools for more profits, more traffic, more exposure, and more productivity! Remember, you also have PLR to this awesome training course! If you have a charity or do marketing for charity organizations you can use this free Google tool to find free money! Training on using 34 Google software and tools: This is important because you will learn ways you can leverage Google's technology to increase your profits, productivity, and leads. 50 easy to follow 1 to 5 minute tutorial videos: This is great because you'll be able to quickly watch the training, and implement what you just learned in your business! You've heard what I have to say. This offer is wonderful. But what's the catch? I'll be honest, you could skip over this offer today and continue trying to create your first product. But you'd have to spend hours of your precious time creating a product, or you would have to shell out $3,500 to $5,000 to hire me to create your next info product! You won't have to pay anywhere near that amount today. In fact, I'm actually going to sweeten the deal for you right now. This will help you you’ll get peer-to-peer support from other people who like to use high quality PLR in their business, and get direct access to me. This will help you finally get your PLR product live without having to spin your wheels anymore! You will follow a step-by-step plan to getting any PLR product live and ready to sell! You will get private label rights to 15 Internet marketing related ebooks! These are ebooks that I spent over $15,500 on when I acquired a successful Internet marketers online business a few years back! These are high quality ebooks full of value. You get 15 ready to go products to edit and sell as your own! You get PLR to a massive course on Google Adsense! This is a step-by-step program on how to earn money with Google Adsense. It is the perfect compliment to the G-Hacks tutorial series! This will help you quickly and easily rebrand your product so you can get it live for sale, and not look just like your competition! Join me for a special customer only live training where I will discuss copywriting, and how to create good converting copy that gets people to stop and take action! I will create a sales page live for this particular product! By the end of the call you will have your sales page so you can start selling this training, and you will have learned my in depth copywriting secrets! If you see the value in this deal you should act quick! Money follows action takers! Yup, that's right. I want to guarantee you take advantage of this offer today, and feel good about it. You're protected by our 30 day money-back guarantee. If for any reason at all you're not completely satisfied, get in touch with our team and we will give you a complete refund. It's that simple. I'm excited for you to jump in and get started. Even more so, I can't wait for you to see the results that are waiting for you on the other side once you start using PLR, and also start implementing my training! This is a ready to go in demand info product that you can sell immediately! You will discover training on using Google's software and tools, plus you will discover some hidden tools that very few marketers know about! All content is covered in 50 easy to follow tutorial videos covering 1 to 10 minutes in length! So easily digestable content so you can go through it and take action. Total value on this product package is easily $799. I'm truly excited for you to get started with this "G-Hacks" PLR, and also look forward to hearing your thoughts on the 34 Google Hacks to boost your bottom line. P.S. You could skip over this offer, but then you'll stay right where you are now. Let me help you get out of the rut you've been in. Start achieving the results you deserve right now. 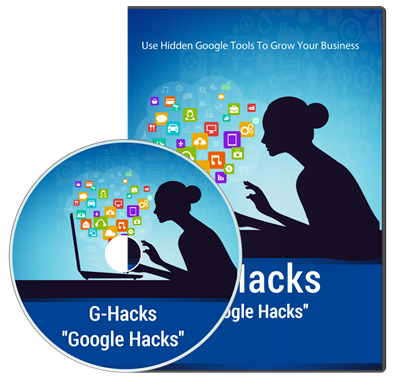 Grab "G-Hacks - 34 Google Hacks To Boost Your Bottom Line" by clicking the buy button above. P.P.S. You're protected by our money back guarantee. So you can try it out today, and enjoy peace of mind. All you have to do is click here to get started!